The iconic Audi TT Coupe has won the What Car? 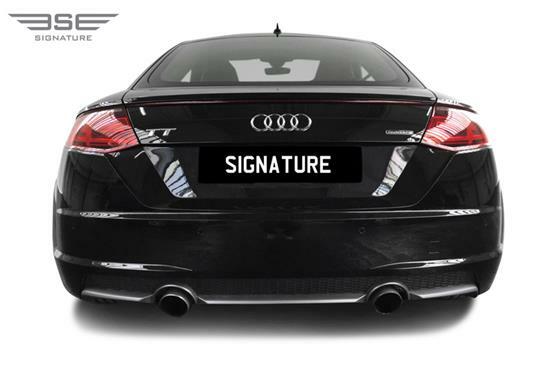 Coupe of the Year award 15 times in the last 20 years, so it is no wonder Signature Car Hire has kept this model on fleet, upgrading to new models as they are released. This Audi TT Coupe hire car is faster and better appointed than previous models and has lots to offer UK car hire renters, especially those looking for an economical sports hire car. The interior boasts a high-tech layout whilst still being extremely user friendly. There is a host of up to date technological features to enjoy and sumptuous materials that inspire. 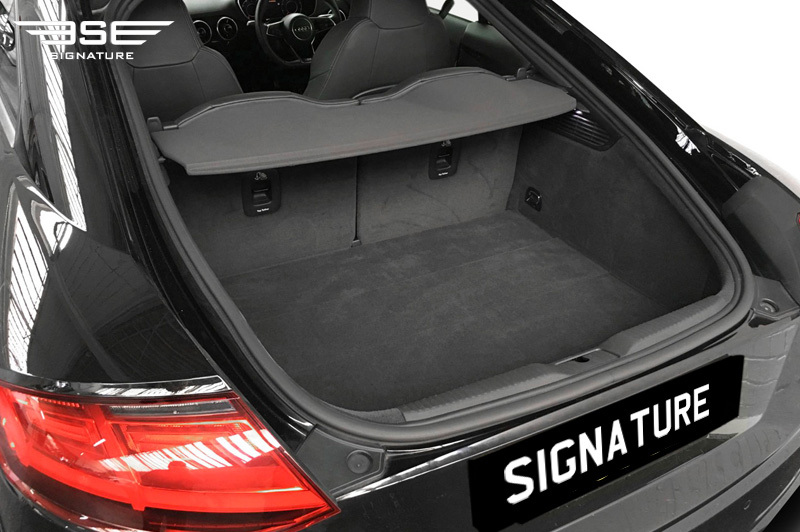 With an easy-to-access boot and rear seats that fold flat this car is practical as well as sporty, with a touch of aggressiveness that we love. 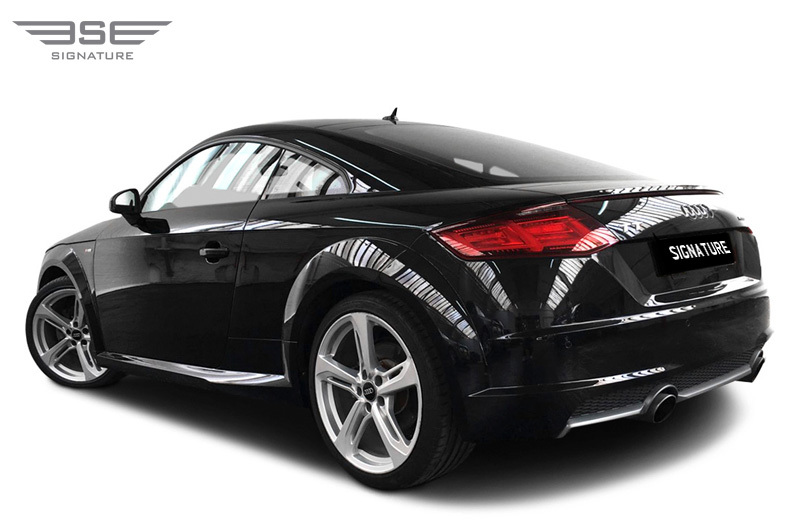 Our Audi TT 2.0 rental car is constructed from mixed steel and aluminium with all-independent suspension and a 1320kg kerb weight, which is good for achieving agility and breath-taking ability. 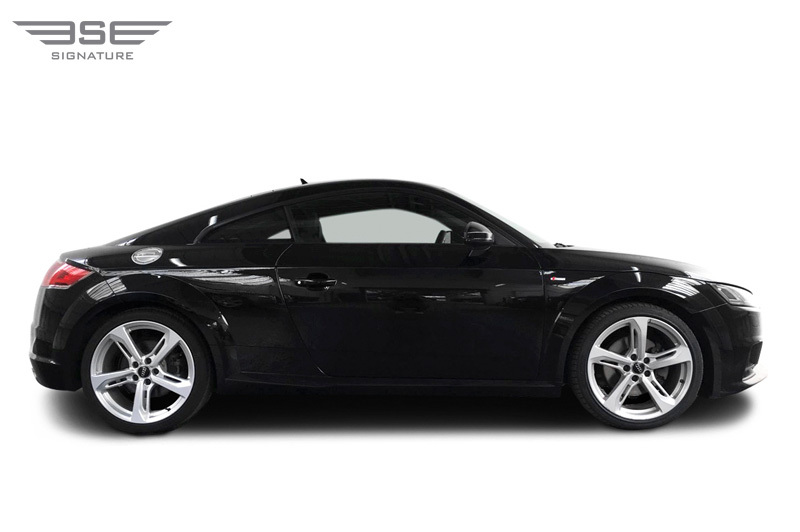 When you hire an Audi TT Coupe UK hire car in London you want to know first how it drives. You can expect a firm but comfortable drive in our rental Audi TT thanks to its new 2.0-litre turbo engine that extends more power than ever before. It steers with lightness but precision. Audi’s ‘Progressive’ electric power steering alters the steering ratio on the go and makes low speed manoeuvring easier. Turn into a corner and the Audi’s light, meticulous steering allows you to know what the front wheels are doing, so you can back off when needed. The TT also feels lively and quick with grip levels that are immense with minimal lean. 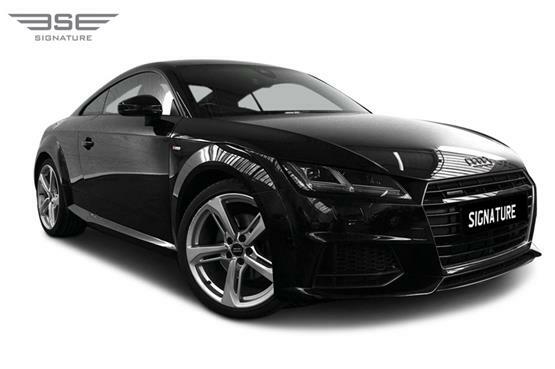 The Audi TT Coupe engine can achieve 0-62mph in just 5.2-seconds. The first few ratios of the seven-speed dual-clutch transmission are pleasantly short and extend a real sense of urgency when deployed with the responsive shifts from the wheel-mounted paddles. Off-the-line and mid-range potency is achieved though the quattro all-wheel-drive setup. It doesn’t feel like one drop of the 242bhp power or 370Nm torque breaks from the tarmac. 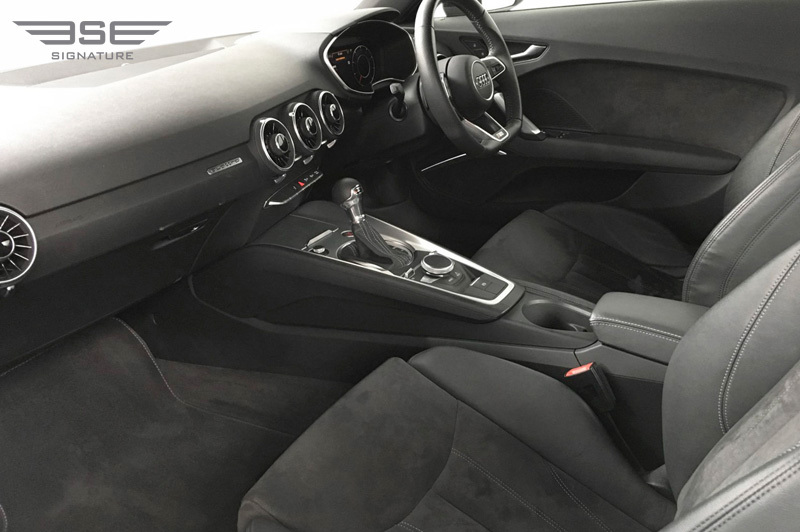 The Audi TT Coupe interior really is breath-taking, showcasing Audis minimalistic design qualities to the max. You can expect a sturdy feel with high-quality materials throughout. The driving position is good, and the fascia is good looking and clutter-free. Look out for the the turbine-style air vents for an innovative design cue. This is a sports car at the end of the day, so you may prefer to use the rear seats for bags and belongings you can’t be bothered to put in the boot or fold the seats down for an extended luggage bay. 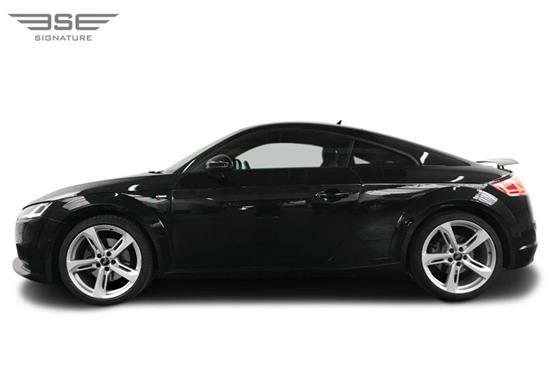 This may be a sporty little number, but the Audi TT still offers comfort throughout, making it an ideal Audi TT Coupe to hire for a day trip. Drivers of most dimensions will be able to get comfortable, thanks to the allowance of adjustment to the steering wheel and the supportive seat. The wide cabin also helps you feel less claustrophobic and bound in than most sports cars. 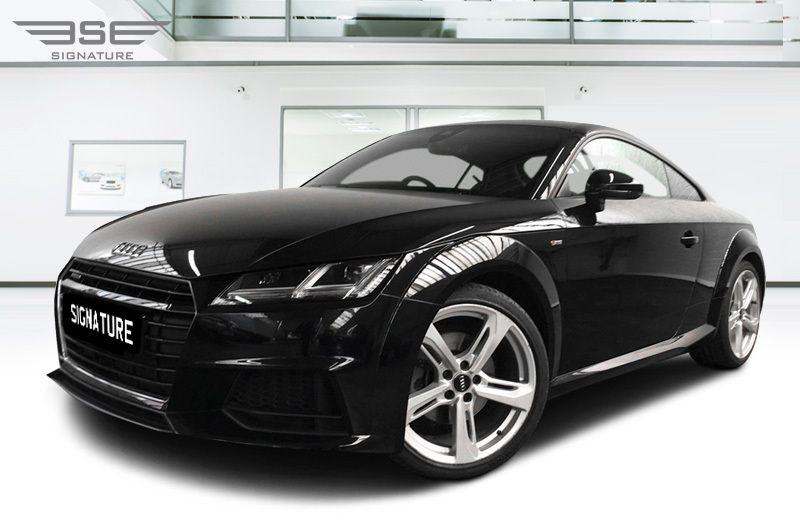 The dash on our black Audi TT Coupe has a beautiful simplicity to its design, a few clearly defined buttons spaced neatly into the fascia showcases Audi’s classy approach to design. A 12.3” digital instrument panel; or ‘Virtual Cockpit’ according to Audi, displays everything including the stereo readout and sat-nav mapping, while also replacing traditional analogue dials for speed, engine revs and other driving essentials. 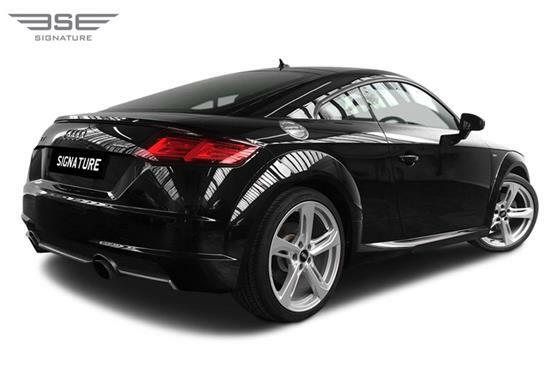 The Audi TT Coupe specifications are impressive. 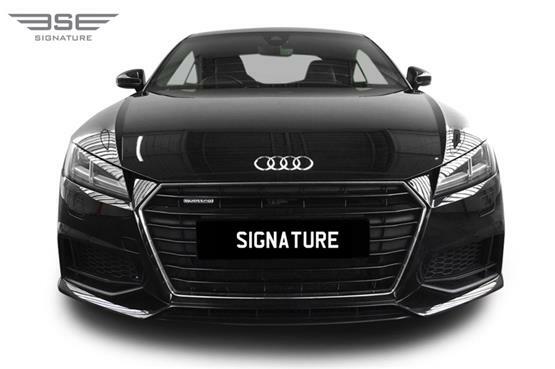 Technological features include air conditioning, Alcantara suede and leather seats, xenon headlights, 18in alloy wheels, electrically folding mirrors, Bluetooth, a light-up USB socket, Audi’s Drive Select system, light and rain sensors, multifunction steering wheel, heated door mirrors, central rev counter layout for the Virtual Cockpit and a DAB radio. We love the brilliant circular air vents that have climate control temperatures displayed within them! Our rental Audi TT automatic comes with four airbags as standard, along with a ‘secondary collision assist’ system that helps to stop the vehicle as soon as possible after an accident. 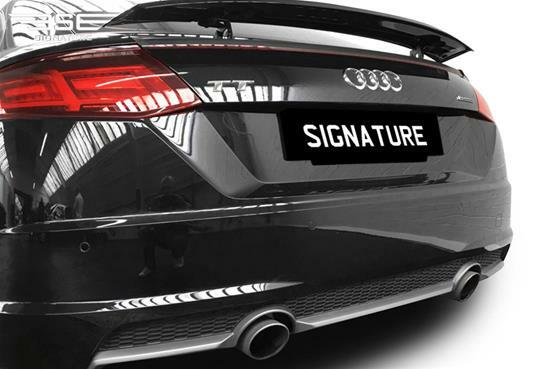 The TT was awarded four stars out of five in its Euro NCAP crash test in 2015, with scores of 81% for adult protection, 68% for child protection and 82% for pedestrian protection. If you want to rent an Audi TT Coupe in the UK on a self-drive hire basis, then give Signature Car hire a call on 0208 845 2244 today or get a quick quote on-line.